You can get involved with the conversation on Social Media by using the hashtags #StopTheWar #SandersLeeYemen #YemenCantWait. You can also email your senators online by filling out your information at StopTheWar.US. You can also directly donate to assist families struggling in Yemen by donating to YemenAid.Org. They recently co-hosted a local humanitarian crisis awareness forum at Salaam Arabic Lutheran Church here in Bay Ridge. You can also volunteer to help get out the word! Rabyaah mentions Doctors Without Borders facilities being bombed. You can donate directly to Doctors Without Borders to help their global outreach mission. Nearly 90% of your donation goes to directly fund humanitarian missions. You can watch Senators Sanders, Lee and Murphy discuss their bill on the floor of the Senate. The bill would have used the War Powers act to declare the war illegitimate, and revoke military aid from Saudi Arabia. Sadly, the bill was returned to the Senate Committee on Foreign Relations for further discussion, which will likely doom the bill. As Rachel mentions in the closing segment of the show, Rep. Dan Donovan sits on the House of Representatives Foreign Affairs committee. Last year, the committee and the House acknowledged that the War was unauthorized, but, confusingly, didn’t go so far as to declare that the War Powers act was violated and that military aid should cease. Contact Rep. Dan Donovan’s office and urge him to declare the war in Yemen a violation of the War Powers act and keep pressure on our legislators to deal with their support of this illegal war in the wake of the Sanders-Lee bill being tabled. 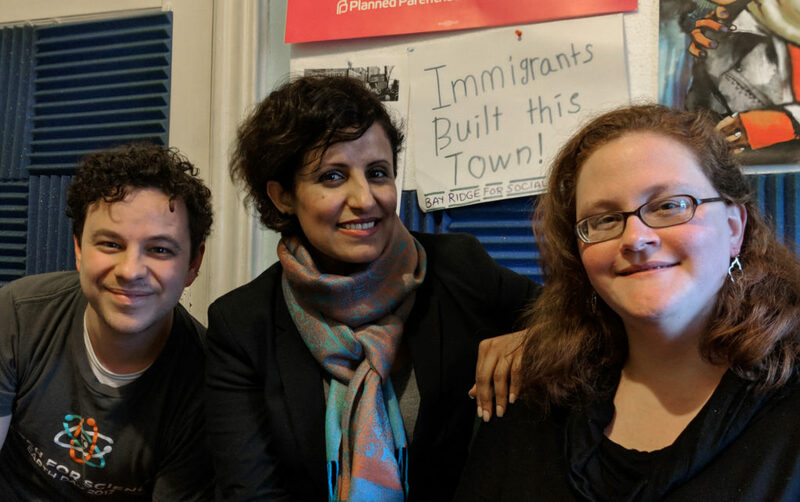 If you, like Rabyaah, want to see an anti-war movement in the world, check out Peace Action New York or the local chapter, Peace Action Bay Ridge. In addition to holding anti-war demonstrations, Peace Action Bay Ridge hosts movie and discussion events and can often be found tabling at street fairs in the neighborhood. Reach out to Peace Action Bay Ridge at [email protected]. You can get more information on the statistics and status of crisis assistance in Yemen by checking out USAid. They have excellent maps and information on the status of aid that is continually updated showing the level of famine around the country. The European Council on Foreign Relations has an excellent historical breakdown of Yemen’s geography and cultural borders through maps. If you were interested in Rabyaah’s overview of the region and the conflict, this is a great place to learn more if you are a visual learner. For a more narrative breakdown, the Brookings Institute has a great analysis by Bruce Riedel. We mention the health crisis that is occuring in Yemen due to the bombings. Airstrikes and war activity have decimated Yemen’s infrastructure and sanitation systems, causing an outbreak of cholera that the Red Cross says has reached over 1 million people. Cholera is easily preventable as long as a population has access to clean drinking water and a way to disinfect food. Mary points out the number of US military installations overseas has been growing since WWII, and today represents a global military presence that presents an enormous financial burden on Americans in addition to heightening military tensions, damaging US’s image in other countries, creating environmental problems, and creating exploitative systems. Few question American military presence on foreign soil, but there is little evidence that US military bases do anything to destabilize regions or promote democracy in totalitarian ones. If you’re looking for a quicker read on military installations, after the Presidential election, Time.com ran an article outlining the reasons why we should close US military bases overseas. We briefly mention the effect of Cluster Bombs on civilian populations. While most countries are signatories to a ban on Cluster Bomb use, Saudi Arabia is not one of them. You can learn more about the use of Cluster Bombs in Yemen from the Cluster Munition Coalition. Finally, you should definitely check out Rabyaah’s latest op-ed calling for the United States to take a strong stand against Saudi Arabia to help stop Yemen’s suffering, she relates some of the suffering of her friends and family over the last three years. Rabyaah’s husband is trapped in India, unable to join Rabyaah in America because of the Muslim Ban or visit his mother, who is suffering from breast cancer without access to adequate medical care in Yemen.